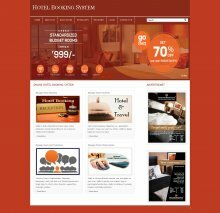 This project Hotel Room Booking System has been developed on PHP and MySQL. We can develop simple php mysql project for students who want to use php online projects to learn The main objective for developing this Hotel Room Booking System Project in PHP is to manage all data in your hotel, example: booking date, check in, check out bills etc. This project provides a lot of features to manage all the data in very well manner. This project contains a lot of advance modules which makes the back end system very powerful. Here students can get php projects with database free download.